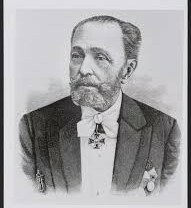 I always enjoy researching and finding out the history of dance and Marius Petipa (1818 – 1910) and The Imperial Russian Ballet come up so often in my reading that I thought that it only fitting to write a bit about him. Marius Petipa is the colossus of nineteenth-century ballet. Other choreographers may well have rivaled him for genius, or have had as great an influence on the art of ballet, but none rivaled him for productivity and none achieved the creation of a monument so grand or influential as the Imperial Russian Ballet, of which he was an effective master of more than forty years. The Imperial Russian Ballet was created out of the combination of French style, traditional in Russia, with newly imported Italian technique which was expressed through Russian bodies and Russian temperament. The result was a new national school of ballet which remains a yardstick for dancers today. The birth of this school is Marius Petipa’s principal legacy. Victor Marius Alphonse Petipa was born into a family of dancers on the 11th of March 1818 in Marseille where his father was at that time ballet master. Like many dance families of the day, the Petipas’ were ever on the move. By the time he was three years old, he was in Brussels with his mother, father, older brother Lucien and older sister Victoria. They stayed in Brussels until 1931. Marius started dancing lessons with his father at the age of seven and first appeared on stage at the age of nine. He didn’t enjoy his lessons in the beginning, but over time he learned to love dancing. Revolutionary activity in 1830 and 1831 drove the family to Antwerp, and then back to Brussels. After this, they lived in Bordeaux for four years. At the age of sixteen, Marius launched out on his own, obtaining work in Nantes where he was called upon to compose a few short ballets. When he broke his leg, he returned to his family and in 1839 they all set out for New York. Their stay in New York was short and they staged some ballets before a manager absconded with their funds. The Petipas’ then returned to Europe. Lucien was already a premier danseur at the Paris Opera, and Marius joined the classes given by eighty-year-old August Vestris. He also partnered Carlotta Grisi at a benefit gala, and then was offered a post as premier danseur at Bordeaux where he danced in Gizelle, La Peri, and La Fille Mal Gardee, as well as staging four ballets of his own. A year later he went to the Royal Theater in Madrid and created four more ballets as well as danced leading roles for four more years. 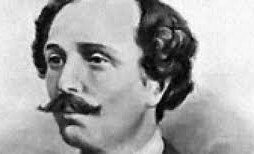 In 1846, he began a love affair with the wife of the Marquis de Chateaubriand, a prominent member of the French Embassy. Learning of the affair, the Marquis challenged Petipa to a duel. Rather than keep his fateful appointment, Petipa quickly left Spain, never to return. In 1847 Marius seduced yet another man’s wife, and the husband called for a duel, yet again. Duels were banned, and the threat of court repercussions loomed over Marius, so the family decided it was best for him to leave France. Marius’ brother, Lucien was familiar with working in Russia and sent an inquiry to Antoine Titus in St. Petersburg. So, Marius Petipa found himself in St. Petersburg late in the same year. And thus began his incredible career ascent to becoming one of the most influential choreographers in history. His experience as a dancer and choreographer stood him in good stead. In his first season, he staged three ballets: Paquita, Satanella and La Peri for himself and principal ballerina, Andreyanova, as well as dancing Albrecht in Gizelle. Marius incidentally was very much under the shadow of his more famous brother Lucien, who was one of the great dancers of the Romantic Age and the first Albrecht. Any hope of his further developing as a choreographer was killed by the arrival in St. Petersburg of Jules Perrot, who remained as ballet master until 1859. During this time Petipa danced leading roles, but his choreographic output amounted to a few brief works, staged principally for his first wife, Marie Surovschikova, whom he married in 1854. Even with Perrot’s departure, Petipa was not to be given a real chance to stage ballets, as Arthur St-Leon was appointed, an accomplished and prolific choreographer, whose ballets were often described as protracted divertissements. He could invent charming solos and duets, but he was less accomplished at the dramatic ensembles which so distinguished the work of Perrot. Despite St-Leon’s attempts to prevent Petipa from being entrusted with any creative work, the director of the Imperial Theater offered him a ballet in 1861. The fact that the work was to star the fading technical abilities of the Italian guest ballerina, Carolina Rosati, who was past her prime, may have accounted for Petipa’s being given what was in effect, a very difficult task. Realizing what an important chance was being offered to him, and with a clear sense of what was popular at the time (in this case the archaeological excavations in Egypt), he went to Paris to consult Vernoy de St Georges, the most accomplished ballet librettist of the time, and together they concocted an intrigue of massive complication, based upon Gautier’s Le Roman de la Momie. On his return to Petersburg, Petipa was told that the ballet had to be completed within six weeks in time for Rosati’s benefit performance. La Fille du Pharaon was a huge success, and Petipa’s reputation was made. The work delighted audiences for the next forty years. Petipa was a genius and his genius lay not only in his sheer ability to make dances but in his power to absorb ideas and accept influences from other choreographers. The next forty years present the picture of a career that was filled with disappointments as well as triumphs. From 1862 to 1869 when St-Leon left, Petipa labored as second ballet master, producing almost alternately both flops and successes. After St-Leon left he was named chief ballet master, responsible for the imperial theaters in St Petersburg and Moscow and the imperial schools. His duty was to produce a new ballet at the beginning of every season. This he did, offering his audiences the sort of grand and complicated productions which had first won him fame. Yet he was not happy turning out spectacle after spectacle, according to August Bournonville, who visited St Petersburg in 1874 and commented on the hollow magnificence of these dance extravaganzas. Petipa agreed but pointed out that the public expected them and were not to be weaned from them. The last two great works of Petipa’s career were The Sleeping Beauty and Raymonda, which we still see companies performing today. He ended up retiring after outliving his career and having endless arguments with both the management and the dancers. Soon after Petipa retired, the Imperial Ballet Company left without a major choreographer went into decline from which it was only saved by the Revolution. Petipa made the Imperial Ballet great at a time when ballet in the rest of the world was sunk into the depths from which it was soon to be rescued by the next generation led by Diaghilev and Fokine. With an audience bent on spectacle and splendor, he provided all the requisite magnificence and technical dazzle. He had at times sacrificed his own tastes to those of his audience and he could produce magnificent ballets to order. He insisted, above all, on the supremacy of dancing, and under his rule, the imperial schools produced and went on producing many of the finest artists of their time, whom the new Russian school made supreme. He constantly extended the range of his dancers, and at the same time was extending his own powers. 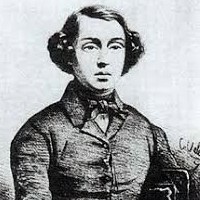 Marius Petipa created over fifty ballets, some of which have survived in versions either faithful to, inspired by, or reconstructed from the original. Thank you Tracy and glad you enjoyed the history lesson. This is a very interesting article for everyone to read, even those who know very little about ballet. I heard about some of his works, like the Sleeping Beauty, but I knew nothing about the man behind it. Marius Petipa’s story is very interesting to read and maybe even learn more about the works he created. Great work writing about this fascinating topic. What an interesting and amazing article about a legend and an icon in the world of ballet and choreography. I think ballet and choreography are hereditary in his family because Marius Petipa’s father was a ballet master. I watched the video and it was really interesting to see the ballet dance invented by Marius Petipa. He enjoyed and had a fulfilled life and has really set a legacy that cannot be forgotten. Great job! Marius’s daughter Marie was also a ballerina, in case you didn’t know about that. Thanks for stopping by to comment. This a very interesting article to read, specially for those who are passionate for history and ballet. I didn’t know who Marius Petipa was, but I have heard about some of his works, like the Sleeping Beauty. Now, after learning more about him, I can see his works from another perspective. Thank you for writing about him and spreading his story.